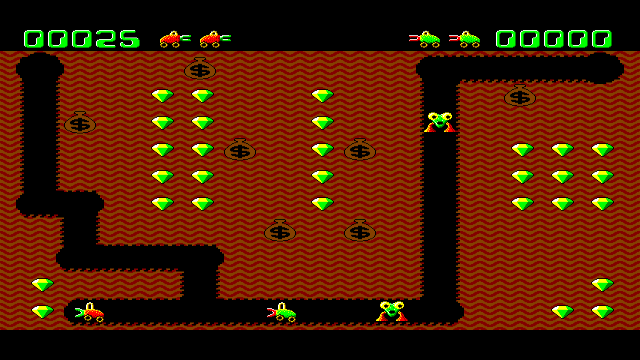 Digger was released on PC in 1983 by Windmill software. Andrew Jenner loved it so much that he created an open source version called Digger Remastered. The object of the game is to get as many points as possible by eating all the emeralds and bags of gold. The Hobbins and Nobbins don't seem to like you doing this and they will try to stop you. You can terminate them by squishing with the gold bags, eating them after you get the magical cherry powerup or shooting them with your slow to recharge fireball. [+ --] d-pad to move, button 1 or 2 to shoot, home to quit. Classic: d-pad to move, A or B to shoot, home to quit. GC: d-pad to move A or B to shoot, start to quit. There are still some glitches with audio (only one sound plays at a time, the bag falling sound isn't stopped early if the bag falls but doesn't break and music only plays on the main menu).